CIA director Mike Pompeo forged a "good relationship" with North Korean leader Kim Jong-un when they met last week, US President Donald Trump has tweeted. Confirming media reports of the secret meeting in Pyongyang, Mr Trump said it had gone "very smoothly". 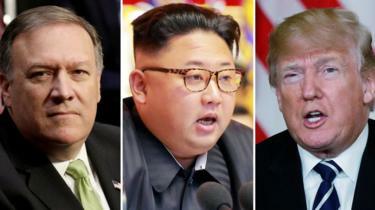 The surprise visit marks the highest-level contact between the United States and North Korea since 2000. Mr Trump is expected to hold a summit with Mr Kim by June. Details are being worked out, the US president said. South Korea has also signalled that it may pursue a formal resolution of the longstanding conflict on the peninsula. President Moon Jae-in and Mr Kim are due to meet next week. The US president earlier gave his "blessing" for the talks between the South and North to discuss a peace treaty to formally end the 1950-1953 Korean War.